The All American: It's a cheeseburger and fries in burrito form. Iheard about a place that had taken drive-in-style burger and fries and made them in burrito form. After a month of abstaining from such culinary excess, I finally found myself at the new Sweeto Burrito in north Spokane, ordering something called the "All American." I wasn't necessarily filled with patriotic pride, but rather ground beef, crispy French fries, bacon, American cheese and something akin to Thousand Island dressing. I was not disappointed, nor was I hungry for the next eight hours... and I only went for the "Middle Weight" size ($6.50), not the "Heavy Weight" ($9.50). The size names match the luchador theme of the emerging chain, which currently has eight locations in Utah, the Dakotas and Virginia, as well as the north Spokane spot and one in Spokane Valley. Sweeto Burrito founder J.P. Francia graduated from Riverside High School in Chattaroy, north of Spokane, in 1985. 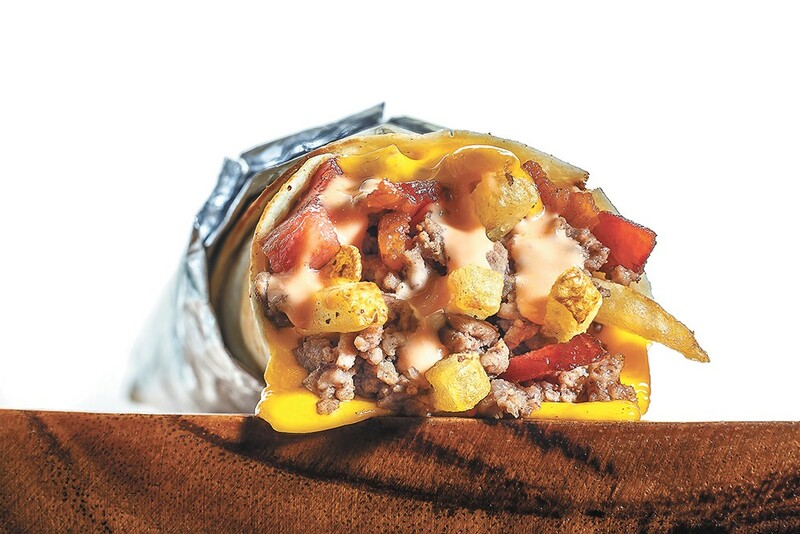 After a career in advertising and television, he started Sweeto Burrito about five years ago as a food truck in North Dakota. His underlying principle? "The tortilla is just a container for awesomeness." This, it seems, has become a rallying cry for those who believe in the burrito-ization of our meals. I'm for this. Wrap up some spaghetti and meatballs in a tortilla and I would eat it. Neato Burrito in downtown Spokane has long been stretching the limits of the burrito with their Thai and barbecue offerings. At Atilano's — which has several locations throughout the area — you can find a regionally inspired offering in the Washington burrito, which includes chicken and potatoes. Other spots have experimented with smoked meats and seafood. The Sweeto concept was enough for Scott Isaak to commit to opening four stores. In addition to the two spots currently open, he'll also open one in north-central Spokane in late October and another in Coeur d'Alene by the end of the year. "I tasted the food and it knocked me on my can," says Isaak. "We cook everything, every day in the back of the house, other than the soda and the tortillas."